Fairly Odd Movie, a set on Flickr. On July 9th at 8 pm, Nickelodeon will air a special called A Fairly Odd Movie: Grow Up, Timmy Turner! to celebrate the series’ tenth anniversary. This show will be live action and CG, not animated! Timmy is 23 but is still living like a child! He is still in 5th grade and living at home. It’s the only way he can still keep his fairy odd parents! When Tootie (Daniella Monet) moves in to the neighborhood, he kinda wants to grow up so he can be her boyfriend. And Every movie needs a bad guy! Hugh J. Magnate (Steven Weber) , a larger than life oil tycoon, tries to get a hold of Cosmo and Wanda for his evil plans! I really like Daniella Monet who plays Trina on Victorious. I’ve met her often and she’s so sweet! (not at all like Trina) I met Drake Bell once at Ariana Grande’s birthday party and he was very kind to my friend and me!! I hope you enjoyed this blog. My mom and I work hard on them. On March 27, 2010, a new series premiered on Nickelodeon. It was created by Dan Schneider and is about a teenager named Tori Vega who attends Hollwood Arts with her sister, Trina and their friends. Ariana Grande plays Cat. Her character is always really happy or really sad. She talks in a high pitched voice and has really red hair. Sometimes she shows off her awesome voice on the show. She sang a song on Freak the Freak Out called Give it Up. In real life, Ariana is an awesome singer, loves her fans, family and supporting charities. She actually starred on Broadway in a show called 13. She was born in Florida and has a brother she’s really close to named Frankie. Ariana is very passionate about a charity called Broadway in South Africa. Ariana loves to stay in touch with her fans through Twitter. She lets you know how much she loves you and when she’ll be somewhere where you can meet her. She is very loving and offers “Free Hugs”. Once she tweeted that she would be at a charity event in Hollywood. We live near there so my mom said we could go. WooHoo! When we got there we found out it was a fund raiser and tickets cost $150 each! My mom talked to the ticket lady and explained we only wanted to see Ari..So the lady let us both go for $150. That’s a lot of money but my mom loves to support charities and I REALLY wanted to meet Ariana. We listened to a lot of awesome singers from Broadway sing that night. We met Matt Doyle, Tom Link and also met the actor who played Sebastian from Little Mermaid! Ariana was awesome. She sang “Beautiful” and one other song. The crowd LOVED her! After, we went up to her. She was with her mom. They were super nice and we got an autograph and lots of pictures. We ran into her again out in the lobby. We told her how much we loved her on Victorious. Her voice in real life is different from Cat’s. She explained that has 3 voices, her “Cat” voice, her “real” voice and her singing voice. In September, she tweeted that she would be at an event at the Santa Monica Pier. It was a charity for the earth called Roots and Shoots. It was the same day as the Jonas Brothers’ Road Dogs Game. We went and waited but had to leave to get to the game before she got there. We left her a note and a picture of us together! A few months later she tweeted thst was going to be a waitress at Chili’s nearby as part of a fund raiser for St. Jude’s Children’s Hospital! When we arrived there were a few friends we knew from Twitter. We all sat together and soon Ariana arrived to serve us. That was a really fun day! 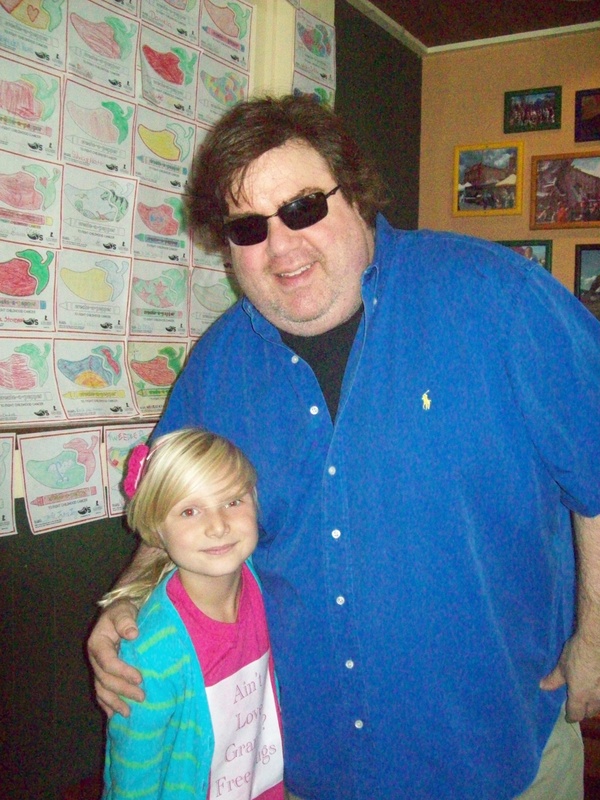 Dan Schneider, Erik Lange, Danielle Monet and Ariana’s family all came out to support her and St Jude’s. 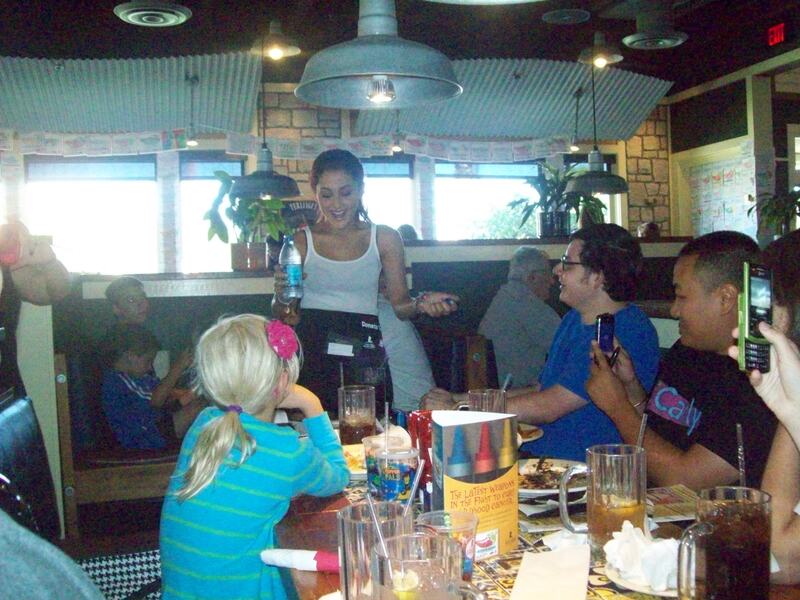 Ariana spent a lot of time at our table and even sang Happy Birthday to someone at our table! I think it was really cool of the Dan, Erik and Daniella to come out and be so nice to their fans and support Ariana and this awesome charity. My mom tweeted that the “Free Hug” I got at the Broadway event cost her $150. She never thought Ariana would actually see that tweet but she did. Ariana is such a cool person that she thought that it was pretty funny. She also gave me a shout out n Twitter and talked about me in a chat! I hope we see Ariana Grande again soon! 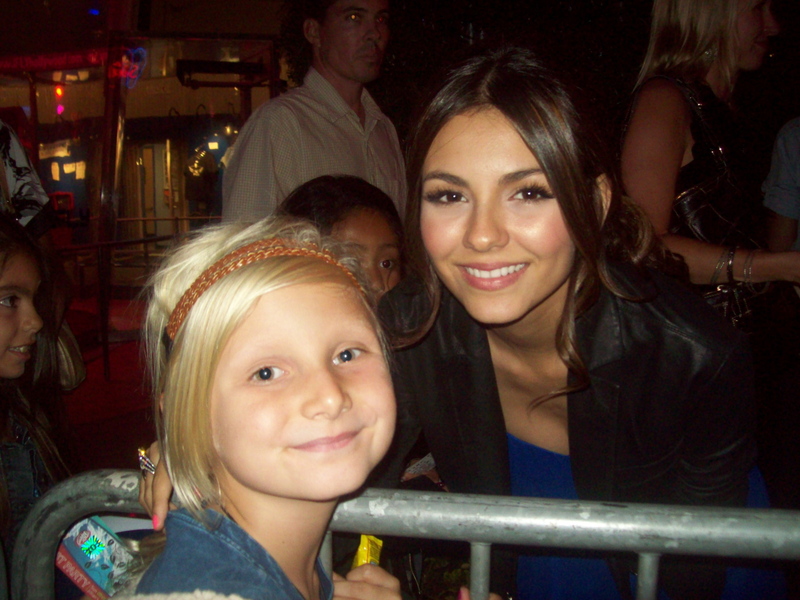 I met both Avan and Victoria Justice at the Teen Choice Awards. They were on there way to an after party so I just got quick pics! 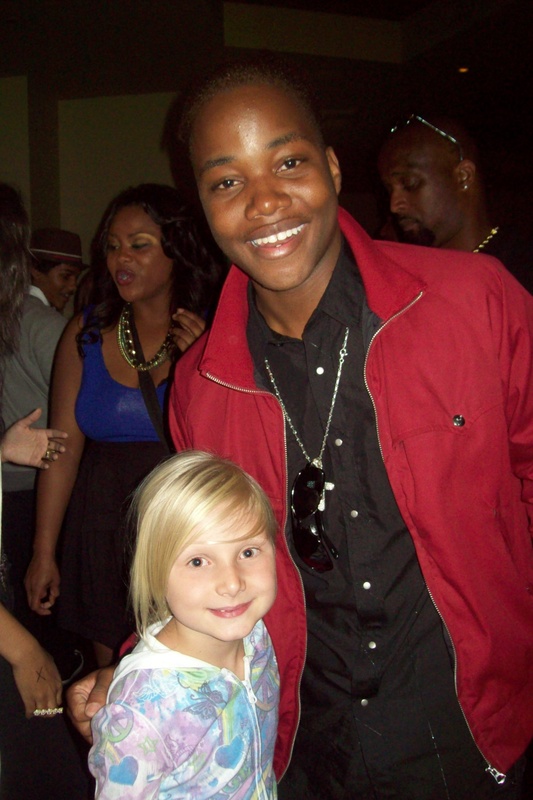 I met Leon at a launch party for Concrete Minds in Hollywood. 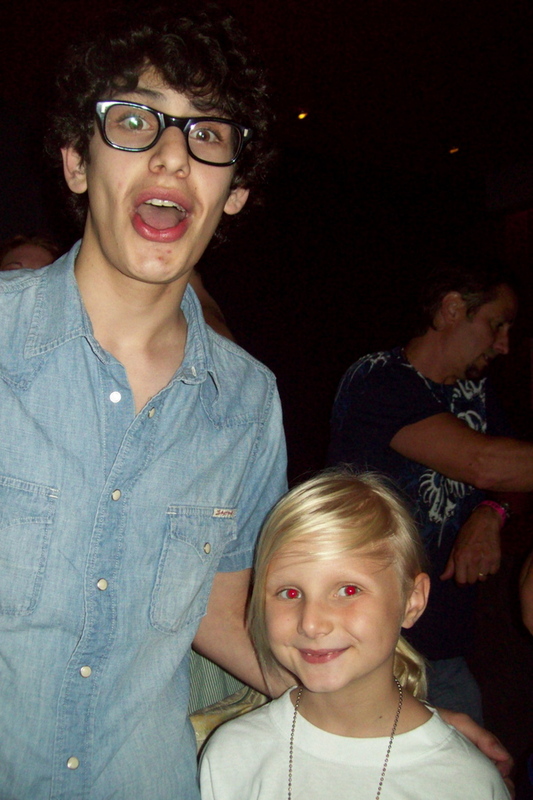 I met Matt Bennett and Danielle Monet a few different times at events… Here’s a pic of me with Matt at the Miss Behave Launch event in Hollywood. He is so silly! I hope I meet Liz Gillies and Mikey Reid someday. I love the show and hope you do too! 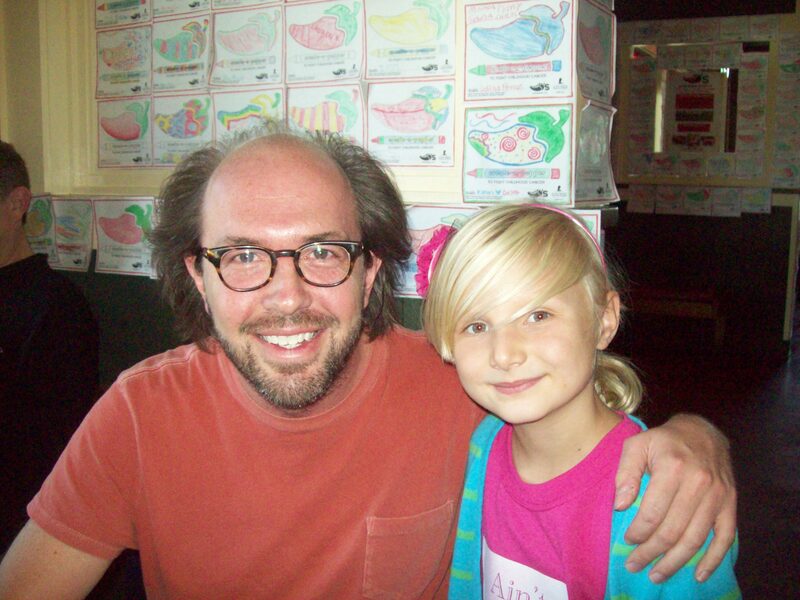 I hope you liked this Blog. My mom and I worked hard on it!